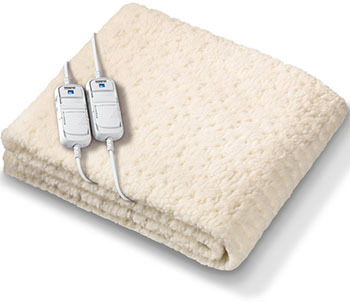 Fitted electric blanket made from soft and cosy polyester fleece that won't budge! Simply slip the Komfort mattress cover onto your bed like a standard fitted sheet and you’re ready to enjoy a level of cosiness you’ve never experienced before! 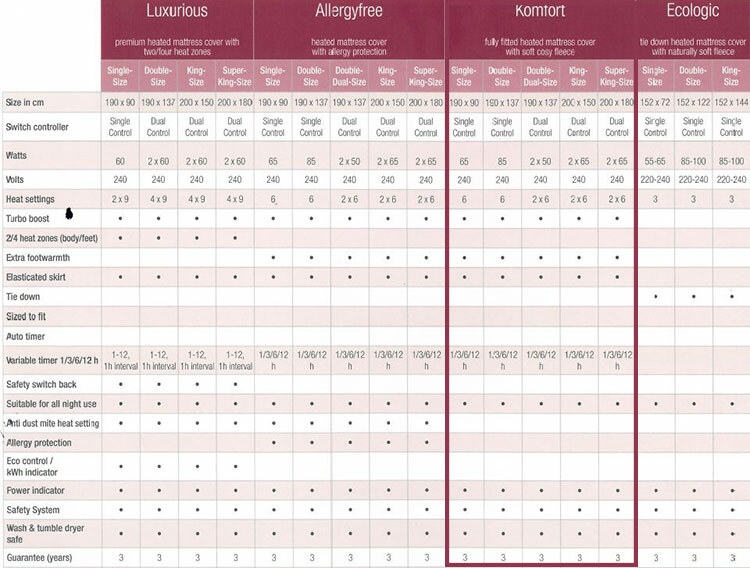 With 6 different heat settings, you can find the perfect temperature for you. Unlike other heated underblankets there’s no need to worry about waking up too hot in the night, as you can set the timer to automatically switch your blanket off after 1, 3, 6 or 12 hours. Its handy pre-heat function will warm your bed up in only 8 minutes, ready for you to climb into and relax at the end of the day. The double, king and super king versions have the option of dual controllers, perfect for if you share your bed with a partner who likes a different temperature than you. With energy bills soaring, keeping warm can be a worry – the eco-friendly Komfort heated mattress protector uses only 2p’s worth of electricity for a full 8 hour night of heat! Machine washable and tumble dryer safe for your convenience. Beurer started making heating pads in 1919; with almost 100 years of designing and manufacturing heating products you can be sure that they know how to give you a good night’s sleep! Their Sleep Safe automatic shut off system ensures that your mattress cover will switch off immediately in the unlikely event that it starts to overheat. The textiles used in the Monogram range are all Oeko-Tek Standard 100 certified; this means they’ve been independently tested to make sure that they contain absolutely no harmful materials. You can sleep safe and sound, as their 3-year guarantee is assurance of the level of quality and comfort offered to you and your family. Heating beds. Easing arthritis, fibromyalgia and muscle soreness. Single - 90 x 190cm / 35.4" x 74.8" , Double - 137 x 190 cm / 53.9" x 74.8", King - 150 x 200 cm / 59" x 78.7", Super King - 180 x 200 cm / 70.8" x 78.7"